A homunculus is a bunch of things masquerading as a single entity. The little being inside your head watching the movie you are making of your life. Sensation and emotion distilled into a metanarrative of consciousness. In psychology, a homunculus is a model of the asymmetrical space body parts occupy in the brain. In alchemy, it’s the tiny fully formed human alive in the sperm that makes a person who they are. Mary Shelley’s Promethean creation in Frankenstein is also a homunculus, a constructed simulation with a soul, as is the misshapen golem of Jewish folklore. Shades of mandrake, Caliban, Grendel, orcs. Modern internet trolls. But we are not post-truth. All truths are contingent. My Homunculus is a collection of voices angling for Truth: smug, optimistic, freaked out, dignified, wretched, cruel, bellowing, bitching, whispers of rumors of The Big T. I am here too, unreliably so, parsing the noise made by disparate souls. This is a fantastic collection, tough and tender all at once and not falling into the trap of lingering too long in either space. Brewer is a wonderful wordsmith—sounds and textures snap vividly into place and you can hear his voice, with its wonderful grain, shining through. Not exactly bebop rhythm. Not exactly rap or slam—but something between the two, interwoven with good solid traditional lit chops. A rich, mature collection by a very talented poet. His eyes say he was never a boy. And all the bullies bigger than him. figures taxed down to six. Earned scowl gouged out of his face. and blocks of flipped real estate. Deals struck, drinks poured — boom, done. and pissed he’s not in front. Sizing up #1 and #2.
silently by smartphone and contract. past him with their oxygen tanks. DeKalb cap and floral muumuu. and auctioning their every asset. But he’s boarding now ahead of me. The unfair world back on his side. 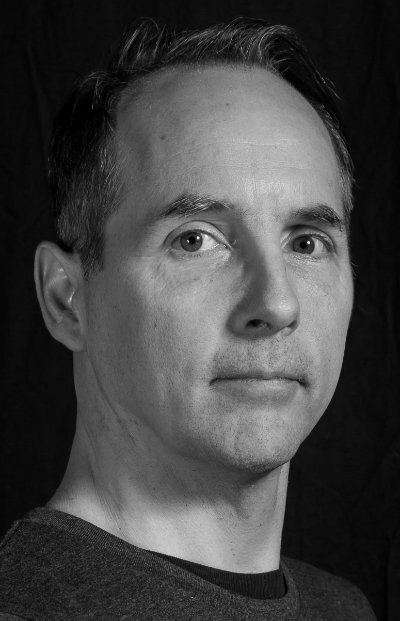 TONY BREWER is a poet, event producer, voice actor, and live sound effects artist from Bloomington, Indiana. He is executive director of the Spoken Word Stage at the 4th Street Arts Festival and his books include: The Great American Scapegoat (self-published, 2006), Little Glove in a Big Hand (Plan B Press, 2010), and Hot Type Cold Read (Chatter House Press, 2013). He also has work in the anthologies And Know This Place: Poetry of Indiana (Indiana Historical Society Press, 2011) and Writers Resist: Hoosier Writers Unite (Chatter House Press, 2017). Tony is literary consultant, sound effects artist, and a regular voice for Cricket’s Bone Caravan audio theatre, which has won awards from the Kansas City HEAR Now Audio Fiction and Arts Festival and the Indiana Society of Professional Journalists. He has produced and recorded for the lit programs Books Unbound and The Linen of Words on WFHB community radio, and Anthology and The Poets Weave on WFIU public radio. He was made a Kentucky Colonel in 2012 and has won numerous awards and earned national recognition for his live sound effects work. Tony has been offering Poetry On Demand at coffeehouses, museums, churches, bars, and art and music festivals for over 10 years, and he is one-third of the poetry performance group Reservoir Dogwoods. By day a mild-mannered book compositor at Indiana University Press, Tony also appears on the 2017 album Paris Suite and frequently collaborates with experimental audio collective Urban Deer.